In my March 2007, post "Our brothers-the Kurds". I mentioned a certain Mossad agent who wrote a book on Iraqi kurds and said "It is not so much a mossad/kurdish alliance. It was more of a friendly alliance between two "opppressed" people. 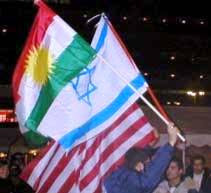 Us, the Israelis having known the Holocaust, understood very well the Kurdish plight for a state of their own." I also mentioned that Kurdish dealings with Israel can be traced as far back as the 70's. The name of this former Mossad agent is Eliezer Tsafrir. Photo above. 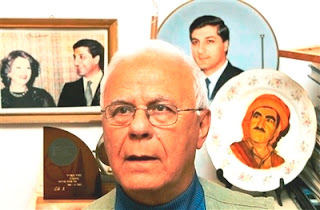 The reader will notice that behind Tsafrir are pictures of the Fascist Gemayel from Lebanon and next to him none other but the late Mostafa Barazani, father of Masoud Barazani, one of the current Kurdish warlords in Iraq. The "Left" who wept for the "kurdish genocide", (a well acted out political mise en scene) including so called "Arab leftists" who supposedly carry unconditional support for the Palestinian cause, and who concomitantly called for Kurdish independence - I demand of you to grovel in mortification NOW. And, what's with these Kurdish figures on plates ? A father and son tradition of eternal remembrance, on Porcelain ? I am suddenly taken by a great urge to dance Greek Sirtaki and smash all those plates to the ground.